Powders and granular materials can acquire an electrical charge on the surface of their particles due to contact and movement against handling equipment and containers. Contact and movement of particles within the material itself can also cause charge acquisition. This process is called tribocharging. It is important to measure particle charge as charge acquisition can lead to problems and unstable behaviour. Charged materials stick to processing equipment and containers, can become airborne more easily, and can flow in different ways than materials with no charge. Many researchers believe that material electrical properties are the most important contributors to powder flow behaviour. The Mercury Revolution and Volution powder analysers provide particle charge assessments of powdered solid particles during dynamic and stable states when in contact with many different surfaces, including stainless steel, glass, and aluminium. Static instruments measure powder that is not moving and typically has been exposed to pressure. For a complete picture of a material’s flow behaviour, both types of testers are required. For solving specific flow problems, usually one type of tester or test is required. Contact us for a quote or to discuss your particle charge analysis needs. Flowability is the capacity to move by flow that characterises powders, i.e. loose particulate solids, as well as fluids. If you need an affordable, easy-to-use method to measure the flow properties and bulk characteristics of your powder then you need to be aware of the Volution Powder Flow Tester. The Volution Powder Flow Tester uses an annular shear cell to measure a powder’s response to consolidating pressure using the yield locus technique. This approach, in conjunction with the instrument’s heavy duty frame and drive system, allows the Volution Powder Flow Tester system to measure powder samples at pressures up to 250kPa (50kg force). This is around 6 times greater than other instruments, which are often more expensive as well. Cohesion is a measure of particle to particle bonding strength that results from inter-particle forces generated by factors such as electrical charges, moisture and van der Waals forces. The angle of internal friction is a measure of the force required to cause particles to slide or move or on each other and is influenced by many parameters including particle surface friction, particle shape, hardness, particle size, etc. distribution, etc. 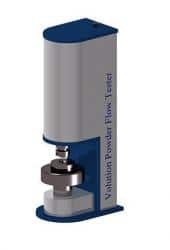 As well as the cohesion and angle of internal friction of the material the Volution Powder Flow Tester can also measure wall friction, time consolidation and unconfined yield strength. The Volution Powder Flow Tester also has built in temperature and relative humidity sensors, which means it will also automatically weigh the sample to provide density and compressibility measurements. Flow functions can be measured by testing the material at different pressures. Meritics can provide this level of functionality at such low cost because design and engineering all takes place in house, thanks to their experience gained over 20 years in the industry. Due to the geometry of its test cell, the Volution can test granular materials as well as powders, which other shear testers cannot, as the test cells for other instruments are too small. With the ION Charge Module you can even measure powder charge too.